The low-biased, fast, airborne, short-range, and range-resolved determination of atmospheric wind speeds plays a key role in wake vortex and turbulence mitigation strategies and would improve flight safety, comfort, and economy. In this work, a concept for an airborne, UV, direct-detection Doppler wind lidar receiver is presented. A monolithic, tilted, field-widened, fringe-imaging Michelson interferometer (FWFIMI) combines the advantages of low angular sensitivity, high thermo-mechanical stability, independence of the specific atmospheric conditions, and potential for fast data evaluation. Design and integration of the FWFIMI into a lidar receiver concept are described. Simulations help to evaluate the receiver design and prospect sufficient performance under different atmospheric conditions. Airbus Customer Services, “Flight operations briefing notes—adverse weather operations—optimum use of the weather radar,” http://www.airbus.com/fileadmin/media_gallery/files/safety_library_items/AirbusSafetyLib_-FLT_OPS-ADV_WX-SEQ07.pdf (2007). J. Baynes and P. Tyrdy, “Rockwell Collins multiscan threattrack TM weather radar,” Rockwell Collins Press release (4February2014. https://www.rockwellcollins.com/Data/News/2014_Cal_Year/CS/FY14CSNR22-ThreatTrack.aspx . A. P. Tvaryanas, “Epidemiology of turbulence-related injuries in airline cabin crew,” Aviat. Space Environ. Med. 74, 970–976 (2003). J. K. Evans, “An updated examination of aviation accidents associated with turbulence, wind shear and thunderstorm,” (Analytical Mechanics Associates, Inc., 2014) http://ntrs.nasa.gov/search.jsp?R=20160005906 . F. Holzäpfel, A. Stephan, T. Heel, and S. Körner, “Enhanced wake vortex decay in ground proximity triggered by plate lines,” Aircr. Eng. 88, 206–214 (2016). G. Looye, T. Lombaerts, and T. Kier, “Design and flight testing of feedback control laws,” (The DLR Project Wetter & Fliegen, German Aerospace Center, 2012), pp. 162–170. J. Ehlers, D. Fischenberg, and D. Niedermeier, “Wake impact alleviation control based on wake identification,” J. Aircr. 52, 2077–2089 (2015). J. Ehlers and N. Fezans, “Airborne Doppler lidar sensor parameter analysis for wake vortex impact alleviation purposes,” in Advances in Aerospace Guidance, Navigation and Control: Selected Papers of the Third CEAS Specialist Conference on Guidance, Navigation and Control held in Toulouse, J. Bordeneuve-Guibé, A. Drouin, and C. Roos, eds. (Springer, 2015), pp. 433–453. J. Schwithal and N. Fezans, Institut für Flugsystemtechnik (FT), German Aerospace Center (DLR), Lilienthalplatz 7, 38108 Braunschweig, Germany (personal communication, 2016). N. Fezans, J. Schwithal, and D. Fischenberg, “In-flight remote sensing and characterization of gusts, turbulence, and wake vortices,” in Deutscher Luft- und Raumfahrtkongress, Rostock, Germany, 2015. S. I. N. Banakh and A. Viktor, Coherent Doppler Wind Lidars in a Turbulent Atmosphere (Artech House, 2013). V. A. Banakh, I. N. Smalikho, and C. Werner, “Effect of aerosol particle microstructure on cw Doppler lidar signal statistics,” Appl. Opt. 39, 5393–5402 (2000). R. L. McCally, “Laser eye safety research at apl,” Johns Hopkins APL Tech. Dig. 26, 46–55 (2005). O. Reitebuch, C. Werner, I. Leike, P. Delville, P. H. Flamant, A. Cress, and D. Engelbart, “Experimental validation of wind profiling performed by the airborne 10-μm heterodyne Doppler lidar wind,” J. Atmos. Ocean. Technol. 18, 1331–1344 (2001). F. Köpp, S. Rahm, and I. Smalikho, “Characterization of aircraft wake vortices by 2-μm pulsed Doppler lidar,” J. Atmos. Ocean. Technol. 21, 194–206 (2004). H. Inokuchi, H. Tanaka, and T. Ando, “Development of an onboard Doppler lidar for flight safety,” J. Aircr. 46, 1411–1415 (2009). H. Inokuchi, M. Furuta, and T. Inagaki, “High altitude turbulence detection using an airborne Doppler lidar,” in 29th Congress of the International Council of the Aeronautical Sciences (ICAS), St. Petersburg, Russia, 7–12 September2014. I. N. Smalikho, V. A. Banakh, F. Holzäpfel, and S. Rahm, “Method of radial velocities for the estimation of aircraft wake vortex parameters from data measured by coherent Doppler lidar,” Opt. Express 23, A1194–A1207 (2015). A. Behrendt, S. Pal, V. Wulfmeyer, A. Valdebenito, and G. Lammel, “A novel approach for the characterization of transport and optical properties of aerosol particles near sources– i. measurement of particle backscatter coefficient maps with a scanning UV lidar,” Atmos. Environ. 45, 2795–2802 (2011). C. Flesia and C. L. Korb, “Theory of the double-edge molecular technique for Doppler lidar wind measurement,” Appl. Opt. 38, 432–440 (1999). Y. Durand, R. Meynart, M. Endemann, E. Chinal, D. Morançais, T. Schröder, and O. Reitebuch, “Manufacturing of an airborne demonstrator of ALADIN: the direct detection Doppler wind lidar for ADM-aeolus,” Proc. SPIE 5984, 598401 (2005). N. P. Schmitt, W. Rehm, T. Pistner, P. Zeller, H. Diehl, and P. Nav’e, “The awiator airborne lidar turbulence sensor,” Aerosp. Sci. Technol. 11, 546–552 (2007). G. J. Rabadan, N. P. Schmitt, T. Pistner, and W. Rehm, “Airborne lidar for automatic feedforward control of turbulent in-flight phenomena,” J. Aircr. 47, 392–403 (2010). M. C. Hirschberger and G. Ehret, “Simulation and high-precision wavelength determination of noisy 2D Fabry-Perot interferometric rings for direct-detection Doppler lidar and laser spectroscopy,” Appl. Phys. B 103, 207–222 (2011). J. A. McKay, “Assessment of a multibeam fizeau wedge interferometer for Doppler wind lidar,” Appl. Opt. 41, 1760–1767 (2002). Z. Liu and T. Kobayashi, “Differential discrimination technique for incoherent Doppler lidar to measure atmospheric wind and backscatter ratio,” Opt. Rev. 3, 47–52 (1996). D. Bruneau, “Mach-Zehnder interferometer as a spectral analyzer for molecular Doppler wind lidar,” Appl. Opt. 40, 391–399 (2001). D. Bruneau, “Fringe-imaging Mach-Zehnder interferometer as a spectral analyzer for molecular Doppler wind lidar,” Appl. Opt. 41, 503–510 (2002). D. Bruneau and J. Pelon, “Simultaneous measurements of particle backscattering and extinction coefficients and wind velocity by lidar with a Mach-Zehnder interferometer: principle of operation and performance assessment,” Appl. Opt. 42, 1101–1114 (2003). C. J. Grund and S. Tucker, “Optical autocovariance wind lidar (OAWL): a new approach to direct-detection Doppler wind profiling,” in Fifth Symposium on Lidar Atmospheric Applications, Seattle, Washington (American Meteorological Society, 2011). R. Atlas, R. N. Hoffman, Z. Ma, G. D. Emmitt, and S. A. Wood, S. Greco, S. Tucker, L. Bucci, B. Annane, R. M. Hardesty, and S. Murillo, “Observing system simulation experiments (osses) to evaluate the potential impact of an optical autocovariance wind lidar (OAWL) on numerical weather prediction,” J. Atmos. Ocean. Technol. 32, 1593–1613 (2015). J. A. Smith and X. Chu, “Investigation of a field-widened Mach-Zehnder receiver to extend Fe Doppler lidar wind measurements from the thermosphere to the ground,” Appl. Opt. 55, 1366–1380 (2016). N. Cézard, A. Dolfi-Bouteyre, J.-P. Huignard, and P. H. Flamant, “Performance evaluation of a dual fringe-imaging Michelson interferometer for air parameter measurements with a 355 nm Rayleigh–Mie lidar,” Appl. Opt. 48, 2321–2332 (2009). G. Hansen, “Die sichtbarkeit der interferenzen beim Michelson- und Twyman-interferometer,” Zeitschrift für Instrumentenkunde 61, 411 (1941). R. L. Hilliard and G. G. Shepherd, “Wide-angle Michelson interferometer for measuring Doppler line widths*,” J. Opt. Soc. Am. 56, 362–369 (1966). G. G. Shepherd, W. A. Gault, D. W. Miller, Z. Pasturczyk, S. F. Johnston, P. R. Kosteniuk, J. W. Haslett, D. J. W. Kendall, and J. R. Wimperis, “Wamdii: wide-angle Michelson Doppler imaging interferometer for spacelab,” Appl. Opt. 24, 1571–1584 (1985). J. M. Harlander, C. R. Englert, D. D. Babcock, and F. L. Roesler, “Design and laboratory tests of a Doppler asymmetric spatial heterodyne (DASH) interferometer for upper atmospheric wind and temperature observations,” Opt. Express 18, 26430–26440 (2010). M. Wirth, A. Fix, P. Mahnke, H. Schwarzer, F. Schrandt, and G. Ehret, “The airborne multi-wavelength water vapor differential absorption lidar wales: system design and performance,” Appl. Phys. B 96, 201–213 (2009). P. Vrancken, M. Wirth, B. Ehret, G. Witschas, H. Veermann, R. Tump, H. Barny, P. Rondeau, A. Dolfi-Bouteyre, and L. Lombard, “Flight tests of the delicate airborne lidar system for remote clear air turbulence detection,” in 27th International Laser Radar Conference, New York, 2015. D. Bruneau, J. Pelon, F. Blouzon, J. Spatazza, P. Genau, G. Buchholtz, N. Amarouche, A. Abchiche, and O. Aouji, “355-nm high spectral resolution airborne lidar LNG: system description and first results,” Appl. Opt. 54, 8776 (2015). 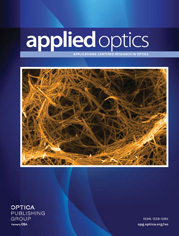 G. Avila and P. Singh, “Optical fiber scrambling and light pipes for high accuracy radial velocities measurements,” Proc. SPIE 7018, 70184W (2008). B. Witschas, “Light scattering on molecules in the atmosphere,” in Atmospheric Physics: Background–Methods–Trends, U. Schumann, ed. (Springer, 2012), pp. 69–83. T. Wriedt, “Mie theory: a review,” in The Mie Theory: Basics and Applications, W. Hergert and T. Wriedt, eds. (Springer, 2012), pp. 53–71. R. B. Miles, W. R. Lempert, and J. N. Forkey, “Laser Rayleigh scattering,” Meas. Sci. Technol. 12, R33 (2001). M. H. Rausch, A. Heller, J. Herbst, T. M. Koller, M. Bahlmann, P. S. Schulz, P. Wasserscheid, and A. P. Fröba, “Mutual and thermal diffusivity of binary mixtures of the ionic liquids [BMIM][C(CN)3] and [BMIM][B(CN)4] with dissolved CO2 by dynamic light scattering,” J. Phys. Chem. B 118, 4636–4646 (2014). S. Groß, V. Freudenthaler, M. Wirth, and B. Weinzierl, “Towards an aerosol classification scheme for future earthcare lidar observations and implications for research needs,” Atmos. Sci. Lett. 16, 77–82 (2015). G. Tenti, C. D. Boley, and R. C. Desai, “On the kinetic model description of Rayleigh-Brillouin scattering from molecular gases,” Can. J. Phys. 52, 285–290 (1974). B. Witschas, “Analytical model for Rayleigh-Brillouin line shapes in air,” Appl. Opt. 50, 267–270 (2011). R. T. H. Collis and P. B. Russell, “Lidar measurement of particles and gases by elastic backscattering and differential absorption,” in Laser Monitoring of the Atmosphere, E. D. Hinkley, ed., Vol. 14 of Topics in Applied Physics, (Springer, 1976), pp. 71–151. A. Bucholtz, “Rayleigh-scattering calculations for the terrestrial atmosphere,” Appl. Opt. 34, 2765–2773 (1995). J. M. Vaughan, D. W. Brown, C. Nash, S. B. Alejandro, and G. G. Koenig, “Atlantic atmospheric aerosol studies: 2. compendium of airborne backscatter measurements at 10.6 μm,” J. Geophys. Res. 100, 1043–1065 (1995). D. J. Moorhouse and R. J. Woodcock, “Background information and user guide for MIL-F-8785C, military specification-flying qualities of piloted airplanes,” (Air Force Wright Aeronautical Labs Wright-Patterson Air Force Base, 1982)..
R. M. Measures, Laser Remote Sensing (Wiley, 1992). M. I. Mishchenko, “Directional radiometry and radiative transfer: The convoluted path from centuries-old phenomenology to physical optics,” J. Quant. Spectrosc. Radiat. Transfer 146, 4–33 (2014). U. Paffrath, C. Lemmerz, O. Reitebuch, B. Witschas, I. Nikolaus, and V. Freudenthaler, “The airborne demonstrator for the direct-detection Doppler wind lidar ALADIN on ADM-aeolus. part ii: Simulations and Rayleigh receiver radiometric performance,” J. Atmos. Ocean. Technol. 26, 2516–2530 (2009). J. A. McKay, “Modeling of direct detection Doppler wind lidar. i. the edge technique,” Appl. Opt. 37, 6480–6486 (1998). M. J. McGill and J. D. Spinhirne, “Comparison of two direct-detection Doppler lidar techniques,” Opt. Eng. 37, 2675–2686 (1998). J. A. McKay, “Modeling of direct detection Doppler wind lidar. ii. the fringe imaging technique,” Appl. Opt. 37, 6487–6493 (1998). J. Wu, J. Wang, and P. B. Hays, “Performance of a circle-to-line optical system for a Fabry-Perot interferometer: a laboratory study,” Appl. Opt. 33, 7823–7828 (1994). O. Reitebuch, C. Lemmerz, E. Nagel, U. Paffrath, Y. Durand, M. Endemann, F. Fabre, and M. Chaloupy, “The airborne demonstrator for the direct-detection Doppler wind lidar ALADIN on ADM-aeolus. Part I: instrument design and comparison to satellite instrument,” J. Atmos. Ocean. Technol. 26, 2501–2515 (2009). O. Reitebuch, Institut für Physik der Atmosphäre (IPA), German Aerospace Center (DLR), Oberpfaffenhofen, Münchner Str. 20, 82234 Wessling, Germany (personal communication, 2016). K. Stelmaszczyk, M. Dell’Aglio, S. Chudzyński, T. Stacewicz, and L. Wöste, “Analytical function for lidar geometrical compression form-factor calculations,” Appl. Opt. 44, 1323–1331 (2005). O. Novák, I. S. Falconer, R. Sanginés, M. Lattemann, R. N. Tarrant, D. R. McKenzie, and M. M. M. Bilek, “Fizeau interferometer system for fast high resolution studies of spectral line shapes,” Rev. Sci. Instrum. 82, 023105 (2011). A. M. Title, “Imaging Michelson interferometers,” in Observing Photons in Space: A Guide to Experimental Space Astronomy, M. C. E. Huber, A. Pauluhn, J. L. Culhane, J. G. Timothy, K. Wilhelm, and A. Zehnder, eds. (Springer, 2013), pp. 349–361. A. M. Title and H. E. Ramsey, “Improvements in birefringent filters. 6: analog birefringent elements,” Appl. Opt. 19, 2046–2058 (1980). Z. Cheng, D. Liu, J. Luo, Y. Yang, Y. Zhou, Y. Zhang, L. Duan, L. Su, L. Yang, Y. Shen, K. Wang, and J. Bai, “Field-widened Michelson interferometer for spectral discrimination in high-spectral-resolution lidar: theoretical framework,” Opt. Express 23, 12117–12134 (2015). SCHOTT, “Refractive index and dispersion,” SCHOTT Technical Information, TIE-29, 2007. SCHOTT, “Temperature coefficient of the refractive index,” SCHOTT Technical Information, TIE-19, 2008. S. Mahadevan, J. Ge, C. DeWitt, J. C. van Eyken, and G. Friedman, “Design of a stable fixed delay interferometer prototype for the ET project,” Proc. SPIE 5492, 615–623 (2004). X. Wan, J. Ge, and Z. Chen, “Development of stable monolithic wide-field Michelson interferometers,” Appl. Opt. 50, 4105–4114 (2011). J. M. Harlander and C. Englert, “Design of a real-fringe DASH interferometer for observations of thermospheric winds from a small satellite,” in Imaging and Applied Optics, OSA Technical Digest (online) (Optical Society of America, 2013), paper FW1D.2. D. Liu, C. Hostetler, I. Miller, A. Cook, and J. Hair, “System analyis of a tilted field-widened Michelson interferometer for high spectral resolution lidar,” Opt. Express 20, 1406–1420 (2012). G. Fortunato, “L’interféromètre de Michelson, quelques aspects théoriques et expérimentaux,” Bulletin de l’Union des Physiciens 91, 15–56 (1997). L. Rodriguez-Cobo, M. Lomer, C. Galindez, and J. M. Lopez-Higuera, “Speckle characterization in multimode fibers for sensing applications,” Proc. SPIE 8413, 84131R (2012). Hamamatsu, PMT Handbook, version 3 (Hamamatsu Photonics, 2007). J.-M. Gagné, J.-P. Saint-Dizier, and M. Picard, “Méthode d’echantillonnage des fonctions déterministes en spectroscopie: application à un spectromètre multicanal par comptage photonique,” Appl. Opt. 13, 581–588 (1974). U. Paffrath, “Performance assessment of the Aeolus Doppler wind lidar prototype,” Dissertation DLR-FB–2006-2012 (DLR-Forschungsbericht, 2006). J. A. Nelder and R. Mead, “A simplex method for function minimization,” Comput. J. 7, 308–313 (1965). Fig. 1. Penalty factor of wind speed measurement κ VLOS (blue), contrast factor G(FSR) (green: R b = 1 , magenta: R b = 2 ), and phase sensitivity S (black) as a function of FSR for 273 K, R b = 1 at a wavelength of 355 nm. Fig. 2. (i) Ray-tracing layout of a Newton telescope with three point sources (1,2,3) at distance R and planes a, b, and c. (ii) Marginal ray angles as a function of R without tilt ( δ = 0 , green) and with a tilt of the laser beam ( δ = 0.1 mrad , blue). (iii) Angular sensitivity of fringe shapes of a fringe-imaging Fizeau interferometer and of a fringe-imaging Michelson interferometer, the latter with and without field widening for collimated light and incidence angle distributions of σ 0 = ± 20 mrad . For better visibility, the fringes for angular distributed light have been shifted in the x-direction. (iv) Illumination beam diameter as a function of distance R for different distances d b . Fig. 3. Monolithic fringe-imaging Michelson interferometer (FWFIMI) tilted by 2° with air arm (1) and glass arm (2). Fig. 4. OPD change in wavelengths as a function of incident angle for FWFIMI field widened for θ t = 0 ° and 2° and uncompensated FIMI. Vertical lines mark the respective tilt angle ( θ t ). Fig. 5. (a) Temperature tuning rate for tuning modes: constant density (TTCD) and constant pressure (TTCP) as a function of the CTE of the spacer and according length of the FS part of a composite spacer made of silica and calcium fluoride. (b) Three-dimensional model of the FWFIMI with composite spacers in the air arm. Fig. 6. Global contrast for angular distributed light incident on an FWFIMI, where the arm lengths d 1 and d 2 are varied around the ideal values for mean angles of incidence of θ t = 2 ° (a) and θ t = 0 ° (b). Tolerances are indicated by white squares. Fig. 7. Effect of net surface radial curvature on fringe shape (a) scheme of the non-sequential ray trace. (b) Integrated fringe shapes of an ideal uncurved fringe ( S E = ∞ ) and of the simulated fringes (c) for radial surface errors of S E = 20 (left) and S E = 10 (right). Fig. 8. Integrated interference fringe shape shifted within round (a) and quadratic (b) illumination and for an additional central obscuration (black circle, dotted lines). Fig. 9. Global fringe contrast as a function of the distance ( d z ) from the exit face of the FWFIMI. Inset: Global fringe patterns for increasing values of d z and ray-tracing layout of the FWFIMI used for the simulations. Fig. 10. (i) Receiver setup for the range-resolved measurement of wind speeds. Blue boxes mark components to be inserted for a fiber-coupled setup. (ii) Scheme of a two-lens optical scrambler with two aspheres of focal length f. (iii) Signal processing: light distributions on the linear detector (LPMT1) for reference and signal light (illumination function neglected). Fig. 11. (a) Detector SNR of one pulse for h = 10 , 000 m , R b = 1 and (b) h = 1000 m , R b = 6 in the cases of the laser transmitters: “WALES,” “MULTIPLY,” “AWIATOR,” and “HYPO.” Two curves are shown for every transmitter, giving the SNR of one center and one edge pixel of the PMT array illuminated with a centered interference fringe. Colored areas mark the regions in between where the SNR values of the other pixels are located. Additional black squares mark the SNR of the third pixel in case of WALES. The solid black line marks a range dependence of the SNR proportional to 1/Range. (c) Total speckle patterns for h = 10 , 000 m , R b = 1 and for h = 1000 m , R b = 6. (d) Exemplary downsampled speckle distribution for one WALES pulse at h = 1000 m , R b = 6 and the respective integrated distributions on a linear detector for 10 signal pulses and 1000 reference pulses. Fig. 12. Results of the end-to-end simulation: the standard deviation σ ( u r ) of the determined wind speed u r as a function of range R for the transmitters “WALES,” “MULTIPLY,” “AWIATOR,” and “HYPO” in case of weak backscattering signal ( h = 10 , 000 m , R b = 1 ) and strong backscattering signal ( h = 1000 m , R b = 6 ). σ ( u r ) is obtained by performing the simulated measurement 50 times in a row. For every measurement, digital averaging is applied for a measurement duration of 0.1 s [ME(0.1 s)]. Three cases are considered: 1. only detector noise (DN), 2. DN and atmospheric speckle, and 3. DN, atmospheric and fiber speckle, and crosstalk. In the last case, the reference measurement is averaged over 1000 pulses for every transmitter type.